If you've always fantasized about having a tattoo but you're scared of the commitment that comes with it, we've found the perfect product for you! We road-tested Penshoppe's Temporary Tattoo Pen, one of their latest personal care products that arrived just in time for summer. Three Cosmo girls tried it, together with our Art Director who was given the special task to draw cute tattoos on our skin. Read on to see our in-depth review! What is the Penshoppe Temporary Tattoo Pen made of? Like any other product, it's best to do a patch test first on your skin to see if you'll have any allergic reaction. The Penshoppe Temporary Tattoo Pen is unscented! It has no inky or medical smell. Is the Penshoppe Temporary Tattoo Pen user-friendly? How do I use it? Drawing perfect artwork on your skin takes practice, so it's best to doodle first using the Penshoppe Temporary Tattoo Pen on another surface like paper or cardboard. It's also an advantage if you excel in doing freehand illustrations. We recommend that you create an outline using a ballpoint pen and then just trace afterward with the tattoo pen. Wash skin and dry completely. 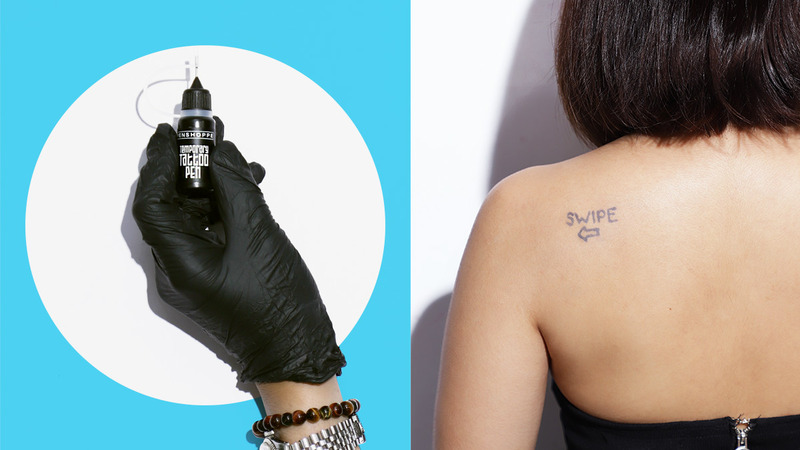 Put on the gloves and carefully draw your design using the tattoo pen. Leave it on and do not touch for at least one hour. Once the ink is completely dry, peel-off or wash excess ink with soap and water. After 24 hours, the tattoo will completely develop. The tattoo may last up to seven days, depending on the area and design. "The pen was challenging to use, but you’ll get the hang of it after a few tries. Don’t expect to pull off intricate details though, especially on small designs, since the pen tip lets out a generous amount of ink all at once." How much is the Penshoppe Temporary Tattoo Pen? The Penshoppe Temporary Tattoo Pen costs P359 for 10ml. It's available at all Penshoppe boutiques and at their online store. See our temporary tattoos and reviews here! The first thing I noticed about the Penshoppe Temporary Tattoo Pen is the "needle" was too thick to create anything minimalist or cute-looking. I have two permanent tattoos and I can surely say that the needles they used on my skin were a fraction of the size of the Penshoppe one. Anyway, for my temp tattoo design, I settled on the word "SEO" on my right wrist with rays emitting from all corners to symbolize the impact it has made on my life. After Jico drew the design, I was shocked at how thicc it actually turned out, but then again not exactly surprising given how big the needle is. The instructions said not to wash the ink off after an hour, so I didn't. But during the waiting period, I accidentally smudged a portion of it somewhere. So when I finally washed it off, it was underwhelming to see the light green pigment on my skin. The box said it would darken in the next 24 hours and it did—but not to black. Instead, I ended up having a dark green drawing on my right wrist that resembled a doodle. Personally, I would just stick to getting an actual tattoo! But for those who aren't ready for that lifelong commitment, this is a great alternative. Just make sure your applicator/brush/needle is thinner than the one that comes with the bottle. I never had a tattoo before. I'm planning on getting a legit tatt this year, but I still haven't thought of the design. It's permanent, so I have to be super duper sure! I thought testing the Penshoppe Temporary Tattoo Pen would be a good trial period. It took me hours to think of a final design. Jico showed me studies of the tattoo I had in mind on paper, and then I chose the one that looked the wittiest. I chose to have a symbolic illustration of "Swipe Left," the motion one does when she/he "rejects" options from a dating app. I wanted it on my left shoulder because obvs it will make no sense if it were on my right, LOL! It will only last seven days, so I was pretty sure I wouldn't regret having a foolish tatt on my body for a full week. During the period that I had my tattoo, I would wear one-shoulder tops (well, this style is my uniform so it didn't feel forced) and sometimes tube tops. Having a tattoo, although temporary, made me feel like a rebel. It was like I wore my heart on my left shoulder, hahaha! It was more confident while I was at the gym, too! My advice: If you want typography tattoos, you must consider the penmanship of the ~artist~ and the letters' thickness. Mine did not turn out to be as minimalist as I expected it to be, because of the thick needle. I still found it cute, though! Fast-forward to the seventh day, my Swipe Left tatt hasn't faded that much. I compared it to my teammates' designs: Theirs are gray, and mine remained solid, thick, and black. It got me thinking, "am I not scrubbing my body enough when I shower?" Anyway, this only proves that the longevity of your temporary tattoo depends on the area you place it. The bottom line: This tool is great to play with, especially if you've got an artsy friend! You just have to control the amount of ink that comes out of the bottle. Otherwise, you might end up with an ink blot on your skin. Tattoos have been quite an obsession of mine since college. I got my first tattoo at 19. It’s a Latin phrase (Sapere Aude) which means “Dare to know” and it’s placed on my back. My second tattoo is a date in Roman numerals on my left wrist, and the most recent one is a sunset on my outer right ankle. I definitely want more tattoos in the future, so trying out the temporary tattoo pen for me was a sure go. TBH, I expected the process to be just like getting a henna tattoo. True enough, it kinda was. I guess one difficulty we encountered the most was that the pen released a generous amount of ink in one squeeze. And unlike my teammates, my tattoo design was more intricate. If your design requires fine lines and curves, you really need a steady hand. Once the tattoo was fully dry, I noticed that it wasn’t as dark as what a regular tattoo would look like. My teammates and I even said it looked like someone just drew on our skin with a marker. I thought it could easily fade. Well, I was wrong. When I woke up the next morning, I noticed the tattoo got even darker. Using a loofah, I tried scrubbing it with soap and water to see if tiny bits of the ink would come off, but it stayed on! Out of curiosity, I tried applying other products like makeup remover and oil to see if it would come off. Still, issa no. It’s been a week since I got the temporary tattoo and I noticed that it had started to fade. It’s back to the “marker-like” phase. And though the design is still clear and noticeable, I wouldn’t consider it as aesthetically pleasing. Don’t get me wrong, it was fun to try the temporary tattoo pen! I recommend that when you do use this product, think of a design that you won’t get sick of because it will really stay with you for almost seven days or more. 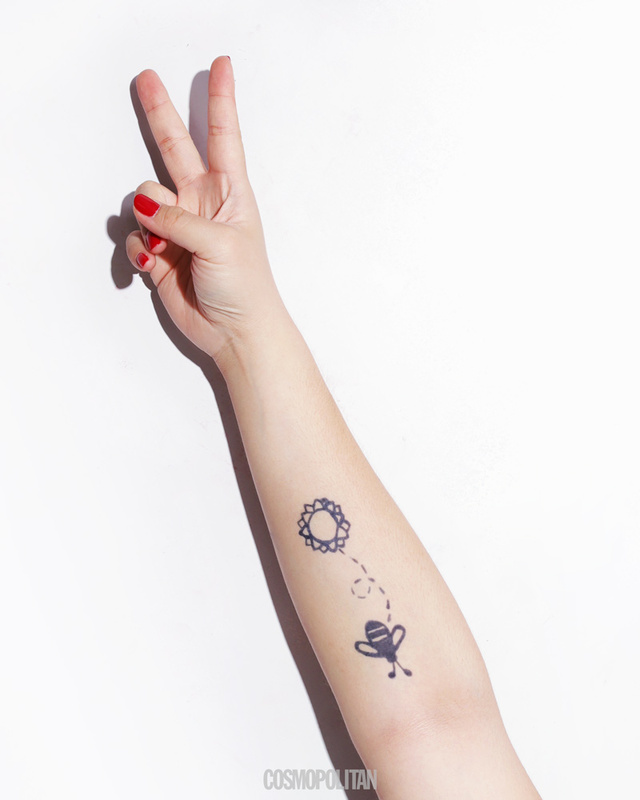 Go for minimalist tattoo designs and remember, when applying the ink, control is key! What's the overall review of the Penshoppe Temporary Pen? The needle is thick, so you need to practice control while squeezing the ink out. Do a patch test first to see if you're allergic with the ink. Draw your desired design with ballpoint ink first, and just trace with the Tattoo Pen. Curing the temporary tattoo takes an hour, so it can be challenging to do your daily tasks. Fading depends on the area where you place the tattoo. For just P359, you can get a cool tattoo, as opposed to a permanent one that will cost you thousands. Follow Tisha, Ira, Lou, Mixi, and Jico on Instagram.